This application works great to capture your iPhone or iPad screen along with the iPhone’s microphone. Everything done on the screen is captured at an adjustable frame rate with the option for showing your finger taps. This app is really great for two reasons: it works really well and it has lots of features. Cost is $4.99. We’ll be using it more to demo apps for our reviews! – Hold the sleep button for one second to start recording. – The device will prompt you to ensure you haven’t pressed the button accidentally. – Press Record and DisplayRecorder will begin recording exactly what’s on the display. – Hold the sleep button to complete the recording. – Wait for the device to finish uploading the video–You can close DisplayRecorder and perform other tasks using your device, but it must not enter sleep mode or switch networks. 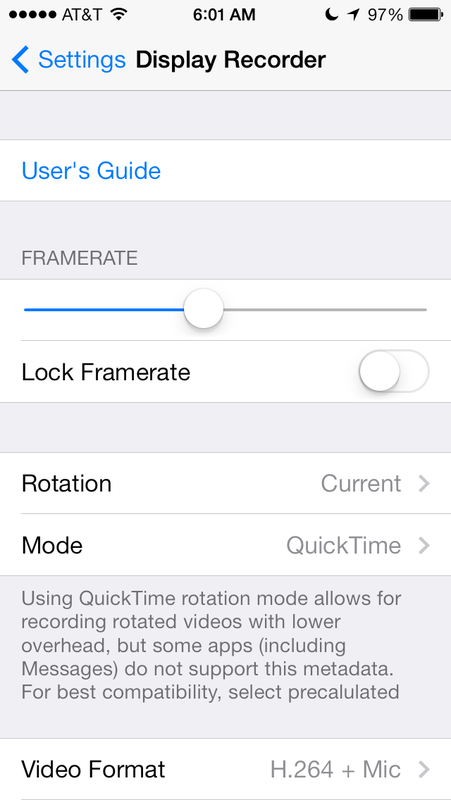 – Framerate: Adjust how smooth the animation of the recorded video is. Higher values require more processing power to encode and take up more space, but result in a higher quality video. 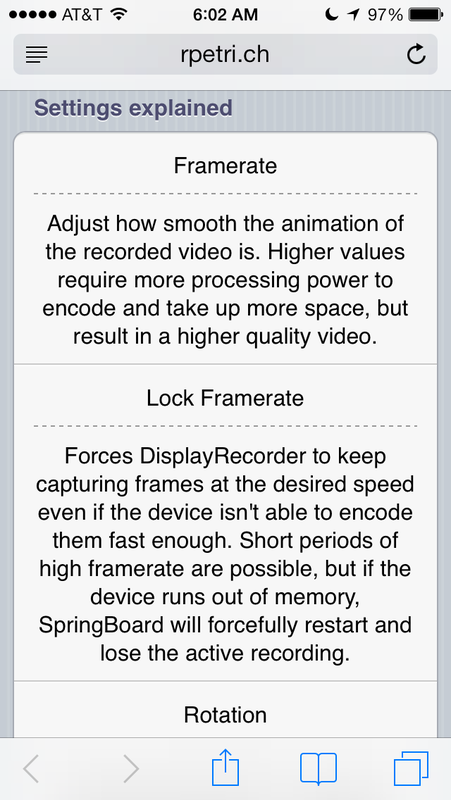 – Lock Framerate: ￼Forces DisplayRecorder to keep capturing frames at the desired speed even if the device isn’t able to encode them fast enough. 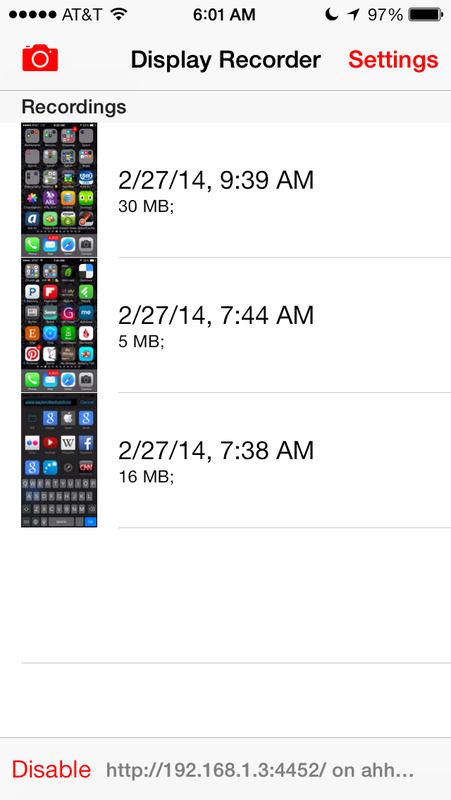 Short periods of high framerate are possible, but if the device runs out of memory, SpringBoard will forcefully restart and lose the active recording. similarly to H.264/MOV, but includes audio input gathered from the device’s microphone. 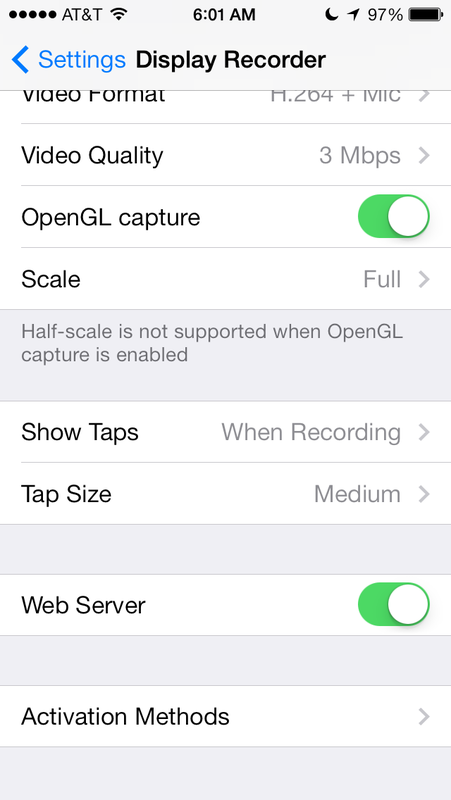 ￼￼￼- OpenGL Capture: Enables or disables capturing OpenGL content. OpenGL content includes games, hardware accelerated video and sometimes camera display. Disabling this option will improve the performance of the capture at the cost of not being able to capture certain content. ￼￼￼- Web Server: Enable or disable DisplayRecorder’s built-in web server. Using the web server you can download recordings, view a live preview of the display, and remotely control your device. – YouTube Account: Login details for uploading YouTube videos. Note: saved login credentials are not encrypted. hi, Where can i find it, i mean the App i couldn’t find it at appstore, so where can i get it?